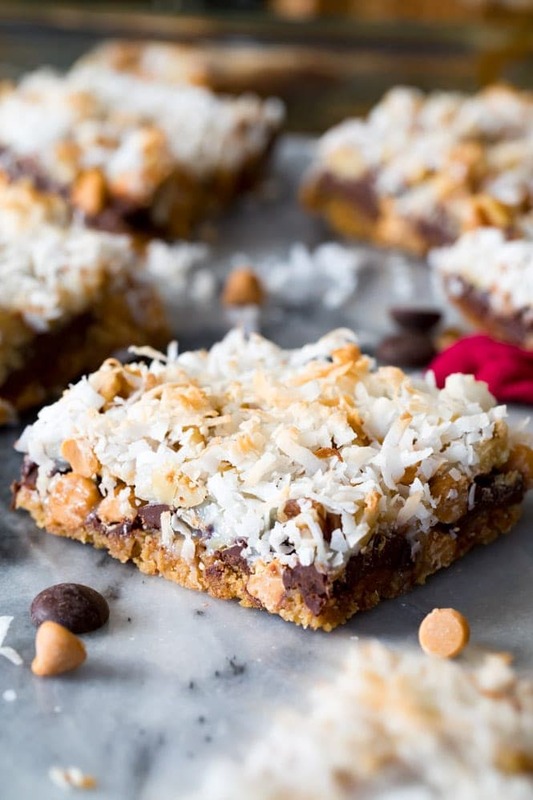 Just 7 ingredients — graham cracker crumbs, butter, chocolate chips, butterscotch chips, walnuts, condensed milk, and shredded coconut — stand between you and these popular classic 7 layer bars (no mystery about how they got their name, huh?). The prep-work is almost non-existent — just layer your ingredients into a 9×13 pan and bake! I’ve been putting off publishing these 7 Layer Bars for much too long because I was worried that they were “too easy”. Too easy. Like that’s some sort of bad thing. Who am I? If you’re here, I’m guessing you enjoy the same kind of recipes that I do. The simple (easy! ), but still from-scratch ones. The ones that blow your friends/family/fellow potluck attendees away with how absolutely amazing they taste and you get to say “oh they’re really so easy to make!” and actually mean it before sending out the recipe to everyone on your contacts list because they all want it… because everyone loves an easy recipe. I don’t need to convince you of that, so I don’t know why I was so worried that too many of you would be so unimpressed by a recipe that’s “too simple”. 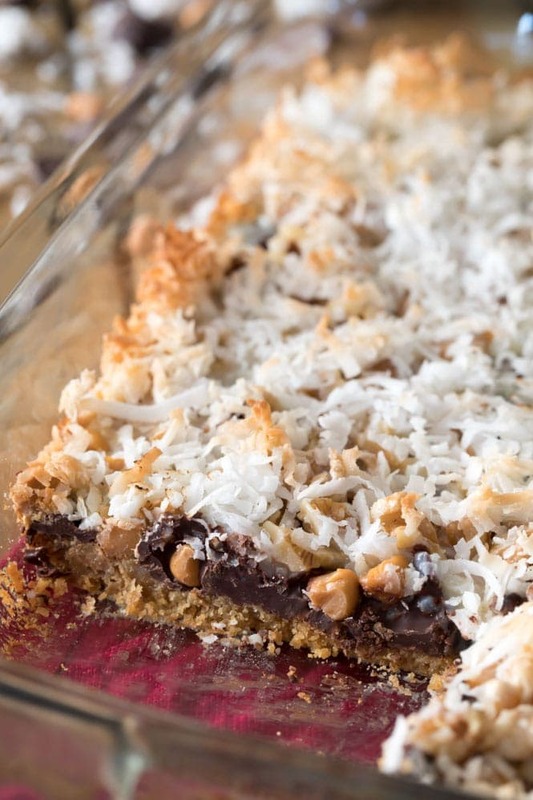 Sorry guys, let’s get on with these so easy 7 Layer Bars, shall we? The first thing you’ll need to do is combine your melted butter and your graham cracker crumbs together in a separate bowl. 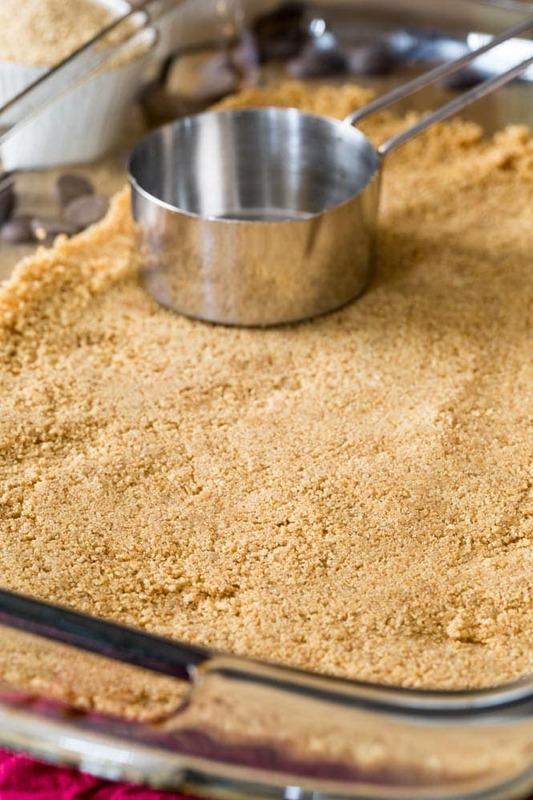 Use a fork to work the two ingredients together until they’re well-combined, and then tamp them tightly into the bottom of your prepared baking dish for a firm graham cracker crust. Honestly, this is the most “complicated” part of the whole process because it involves combining two ingredients (and I use salted butter here specifically so we don’t have to add salt and make these 7 Layer Bars 8 ingredients… that would just be awkward 😉). Once you’ve done this part, you’ll just spread/sprinkle/drizzle the rest of your ingredients evenly over the base and bake for about 25 minutes. 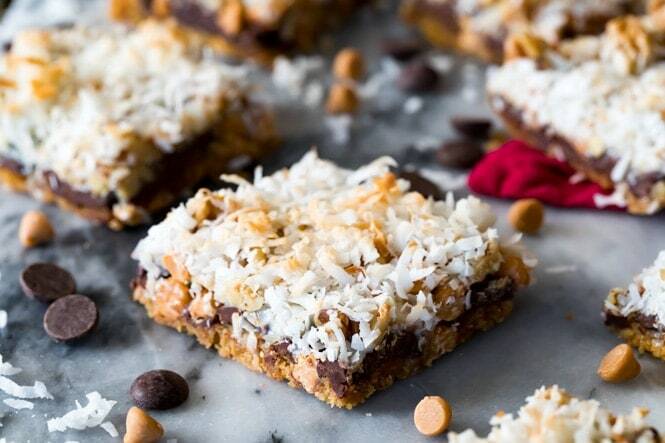 Most traditional 7 layer bar recipes will bury the coconut layer beneath the sweetened condensed milk but I prefer to top my bars off with it instead. The coconut will become lightly toasted in the oven, giving you a slight sweet crunch in every bite. 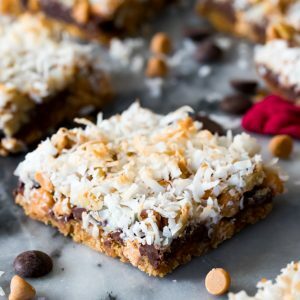 If you prefer the original method, just layer the shredded coconut beneath your chopped walnuts (or pecans, either nut will work) and the sweetened condensed milk will be the last ingredient that you add on top before baking your 7 Layer Bars. I prefer to enjoy these cookie bars when they’re still warm, but the hotter they are the messier they will be. For neater cookie bars, wait at least an hour or two before slicing and baking (you can speed up the process even more by putting your 7 layer bars in the refrigerator, but I personally don’t like them cold and think that it makes the chocolate too hard to bite through). Classic cookie bars made with just 7 ingredients. The prep-work for these cookie bars is so easy -- just layer your ingredients into a pan and bake! Preheat your oven to 350F (175C) and lightly butter the sides and bottom or a 9x13 baking dish. Set aside. 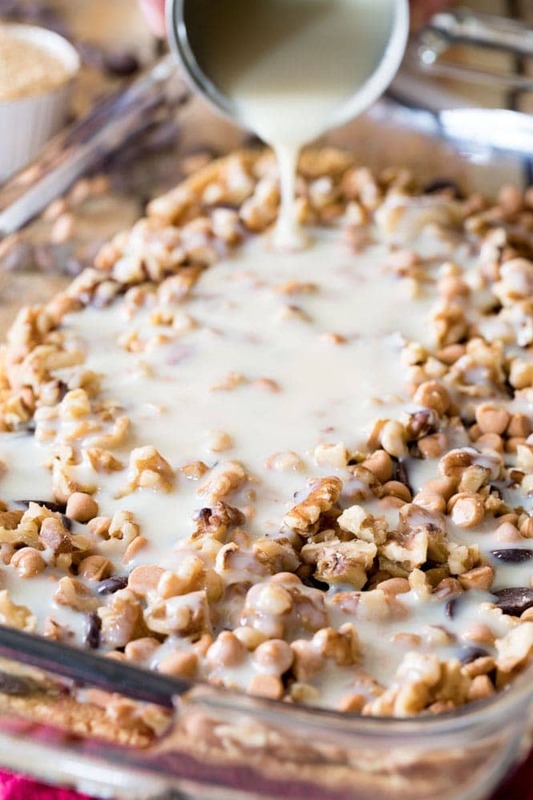 Pour chocolate chips, then butterscotch chips, then chopped nuts, evenly over the graham cracker crust layer. Drizzle ingredients in pan evenly with sweetened condensed milk. Evenly sprinkle coconut over the condensed milk. Transfer to oven and bake 350F for 25 minutes or until coconut is turning lightly golden brown. Could you substitute chocolate graham crackers for the crust? Hi Sam – can I leave out the coconut? Also, just want to let you know that I have tried your “thin” mint over the weekend….was EXCELLENT!! Love these bars and the easy recipe! Thank you! All of your recipes are so very good. I also made your lace cookies at christmas time, they turned out to be great! I’m so glad you like them and appreciate a good easy recipe, too! Aren’t those lace cookies awesome! My family was skeptical but ultimately they were such a hit! Thanks Glenda!! What is the full nutritional value of these bars? Need the sugar and carb counts. Hi Linda, I’m not sure as I don’t calculate full nutrition and it will vary based off of the ingredients that you use. I recommend using MyFitnessPal(.com) and entering your ingredients to get all the information that you need. I hope that helps!